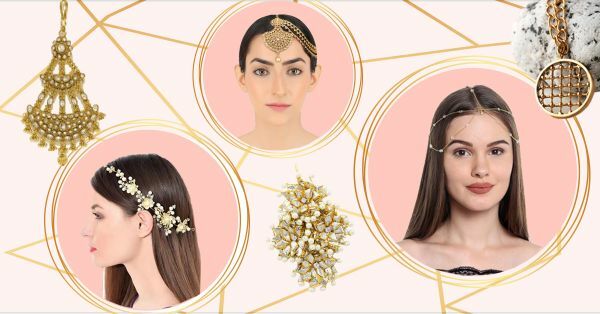 The Most *Stunning* Hair Jewellery That Is Perfect For Your Sangeet! Accessories make everything better, even your shaadi outfits! Sometimes, a statement hair accessory is all you need to stand out and look every bit stunning. And your sangeet function is one occasion where you can go all out and experiment with the jewellery. From edgy to elegant and traditional, we have picked out 10 hair jewellery pieces for the special night. Paasa is one of the newest hair accessory and is loved by brides this year. Designed with tiny little ghungroos hanging at the bottom, we are sure this would look stunning at your sangeet night. With a royal anarkali or a lehenga, this will be the only accessory you need. This stunning headband would look great on a bride who wants to experiment with her look for the sangeet function. Paired with a gown or a crop top and skirt, this accessory would transform every bride into a Greek beauty! A one-sided maangtika, not only is the accessory totally unique but would give you some stunning side profile photos too! Studded with american stones and a pearl drop, it is just the prettiest piece ever. Subtle yet stylish; this stringy hair jewellery is sure to make an impact. With its delicate crystal maangtika and multiple chains, we are definite about how amazing this one is going to look. Pair it with a voluminous gown and danglers. For a delicate look at your sangeet, an embellished headband would be the perfect hair accessory. With a with mix of rose, opal and alabaster diamonds and crystal stones, this one sure makes for an elegant piece. To complete your fusion look, this is the only hair accessory that you need. If you plan to wear an elaborate maangtika on your wedding day, this delicate maangtika would be ideal for your sangeet function. Loose curls with a floral clip on one side and you’re done! If you are wearing a heavy outfit along with heavy jewellery, then this floral clip is all you need. With its delicate finish, we are sure it will make you feel even more beautiful. Pull your hair back and secure them with this stunning hair barrette which is embellished with stones. Classy and elegant, it is perfect for the bride who likes to keep her accessories to a minimum. Bring out the princess in you with this diamond studded tiara. For the bride wearing a gown on the sangeet night, it is just the perfect hair accessory. What better than a tiara to make you feel like a princess! If your mehendi is followed by the sangeet night, then here’s a maangtika that’ll look good for each of the functions. Add some spark to the traditional gota maangtika with pretty pearls! We are absolutely loving this handcrafted piece by designer Aprajita Toor, what about you? !